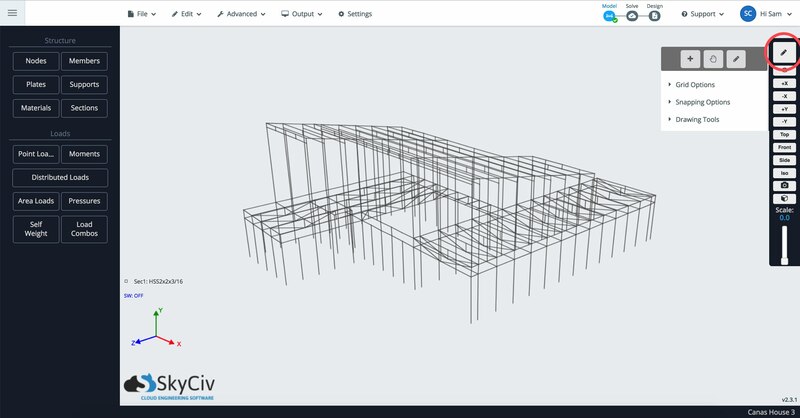 SkyCiv has built out a range of features that make the modelling process extremely and fast and easy. One of these great set of mouse click functions, that once used to, can allow users to mock up a model with a few clicks. Rotating - Left click and drag to rotate your structure. Panning - Right click and drag to pan. Alternatively use Shift + Left Click. Select - Left click a member/node/plate/support/load. Multi Select - Ctrl + Left Click. Create Member - Left click starting node, drag to ending node, and release on ending node. Click and dragging in either direction will do something different! Click and drag to the RIGHT will select anything that comes in contact with the box. Click and drag to the LEFT will highlight anything that is entirely within the box. Both can be seen in the image below. The Length box will auto display the length of the distance from the reference node (and hence the length of the member). At any point you can enter a length and hit Enter, or click, to apply that member length. Enter a length and click the (lock) icon to lock the length. Now you can create members fixed at this length. SkyCiv has introduced a couple of quick repair functions that allow users to easily detect and repair issues with your model. This is slightly different to SkyCiv's Repair Model functionality which will repair your entire model. This is focused on your highlighted elements that the user can easily identify. For instance, two nodes closely together can be merged using the Merge Nodes feature. Here is the full list of quick repairs that are automatically detected by the software when you highlight and right click parts of your structure. Not so much of a repair feature, but more a useful tool that allows you to add a node and split the member based on some input.